Water is sacred and it has been worshipped in India since time immemorial as one of the ‘Panch Bhootas’ (Five elements of life). Evolution began in water and the future revolutions will be for water. Most of the great rulers in India had wisdom and vision for future and that is how the desert state of Rajasthan survived the fury of nature for so long. 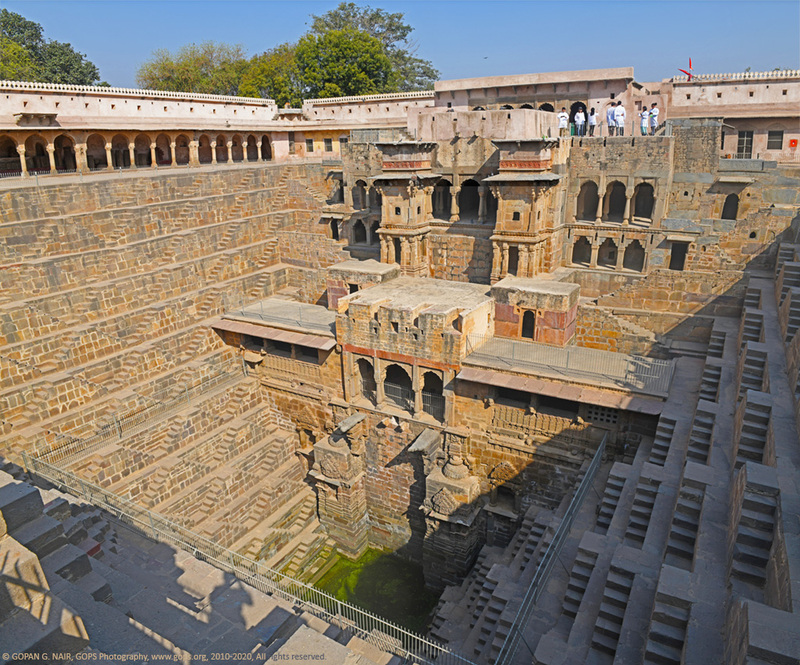 A little known place Abhaneri near Jaipur in India is where the World’s largest step-well is situated. Abha Nagari (The City of Brightness) as it was called originally was founded by King Raja Chand of Nikumbha Dynasty between 8 and 9th century AD. 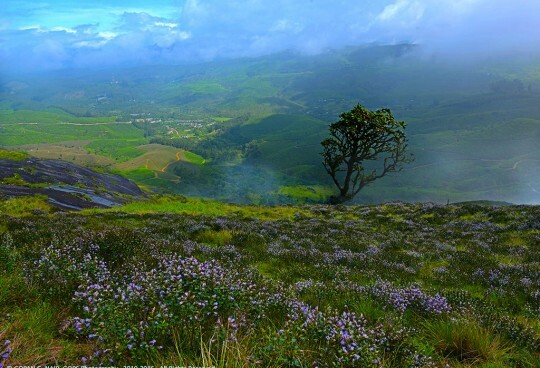 The ancient Hindu wisdom observed close links between worship places and the nature as the means for protecting the environment. 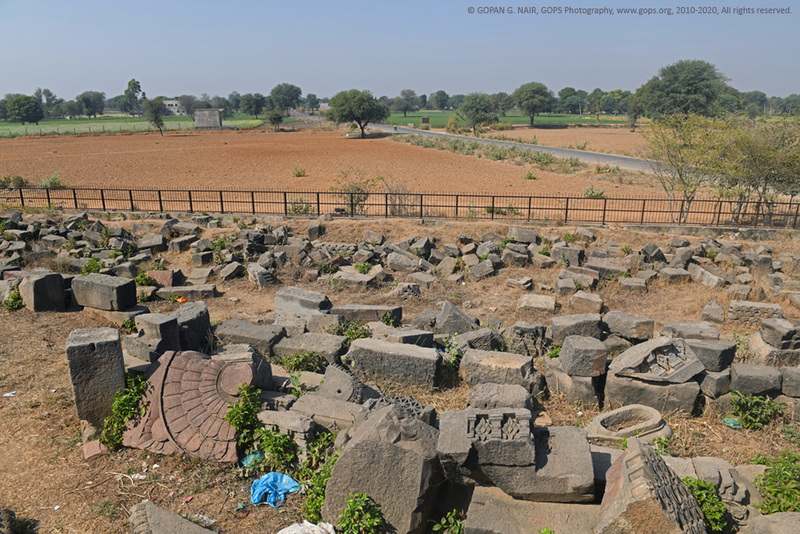 This is evident from ancient temples in India with associated wells or ponds still in working condition. 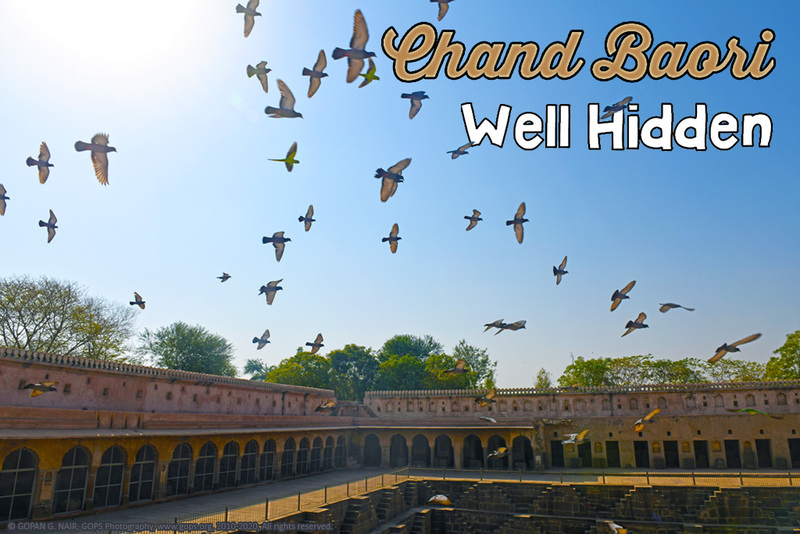 Following this tradition, King Chand constructed a large baori (step-well or step-pond, बावड़ी or बावली) in Abhaneri sometime in 825 AD, which remains as one of the architectural marvels of ancient India. 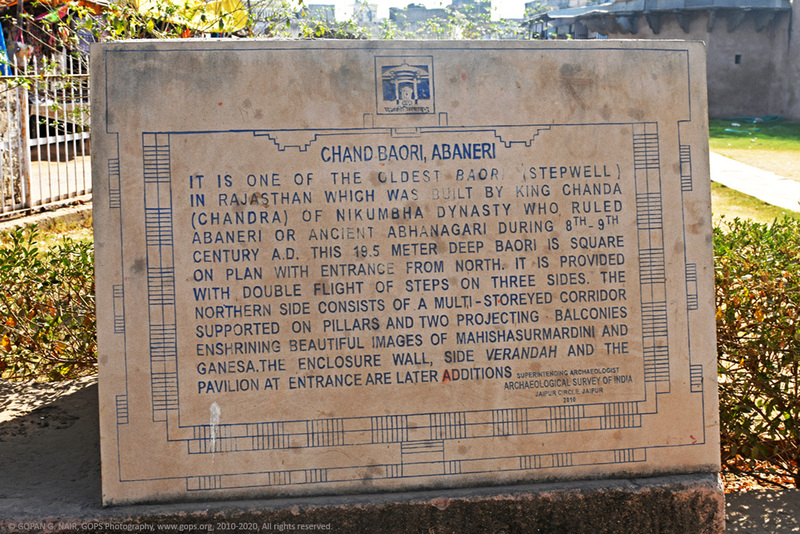 Chand Baori (Chand bawadi in local tongue) as it called today attracts hundreds of tourists from around the world. 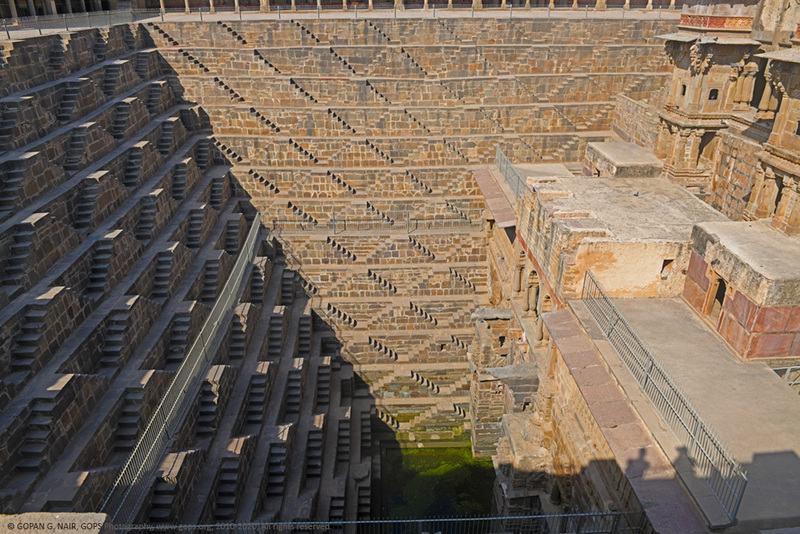 The baori is square in shape measuring 35 meters on each side, 19.5 meters deep and has 3500 steps built in geometrical patterns on all 3 sides. The architecture was engineered to withstand earthquakes and other natural forces. Certain step wells used bullock-turned water wheels to lift the water up, but I am not sure about such a mechanism employed here. 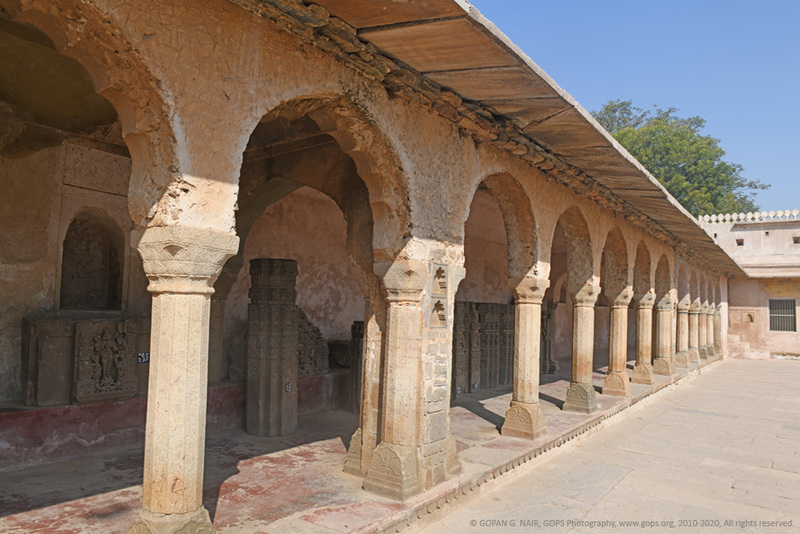 The main entrance is on the northern side of the well which has a pavilion with pillars that leads to a set of bath rooms and resting halls made for the royal family. 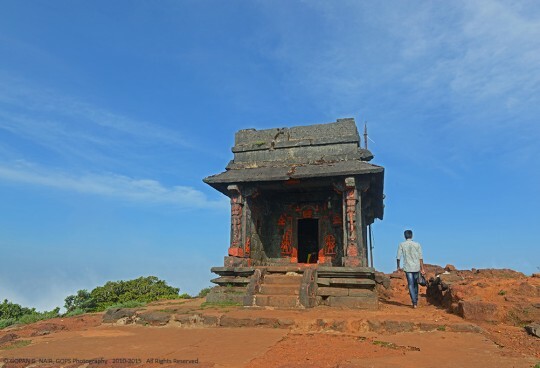 This side also consists of multistoried mandaps with worship places decorated with Ganesha and Durga idols. 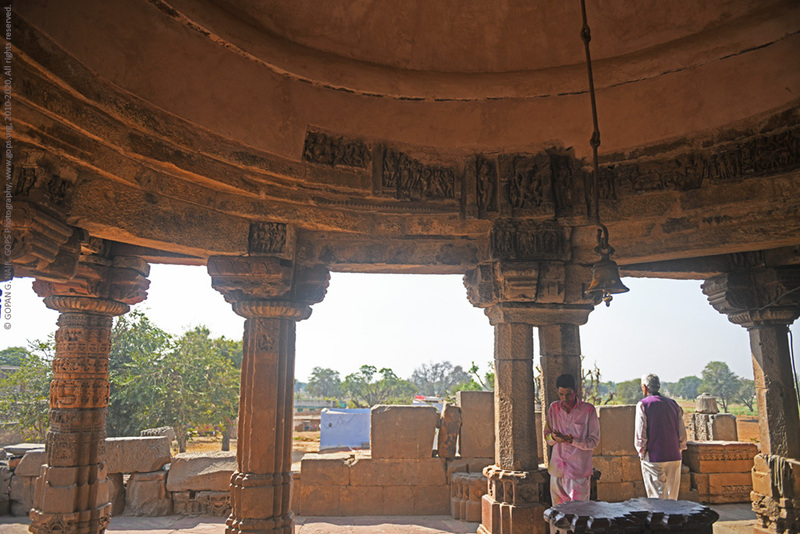 The bottom of the well usually maintains a temperature 5 degrees lower than the surface and the kings used to take rest in these rooms during peak summer days. It was also a practice to cleanse the body before entering the adjoining Harshat Mata temple. It is also believed that there were secret underground passages leading from the royal bath rooms to the temple. 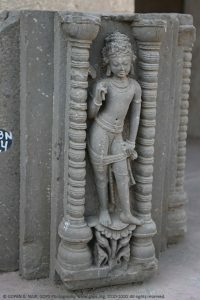 The long hallways around the baori were built later which showcase the artifacts collected from the ruins of the temple. The well which goes 13 storeys down was filled by means of rain water harvesting and supplied enough water to the surrounding villages. 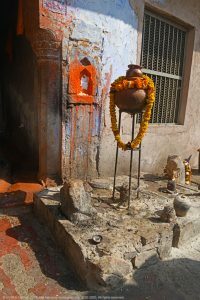 There is a small Shiva shrine at the entrance of the baori where a priest conducts regular worship every day. The priest told me that the well was built in a day with magical powers. Today, the access to the stairs is restricted to the public due to poor safety measures employed at the site. However, several Hollywood and Bollywood movies have chosen this location for their shooting. 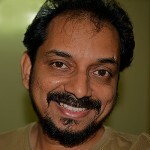 The Fall, The Dark Knight Rises, The Best Exotic Marigold Hotel, Bhoomi, Bhool Bhulaiyaa etc are some of the movies picturized here. 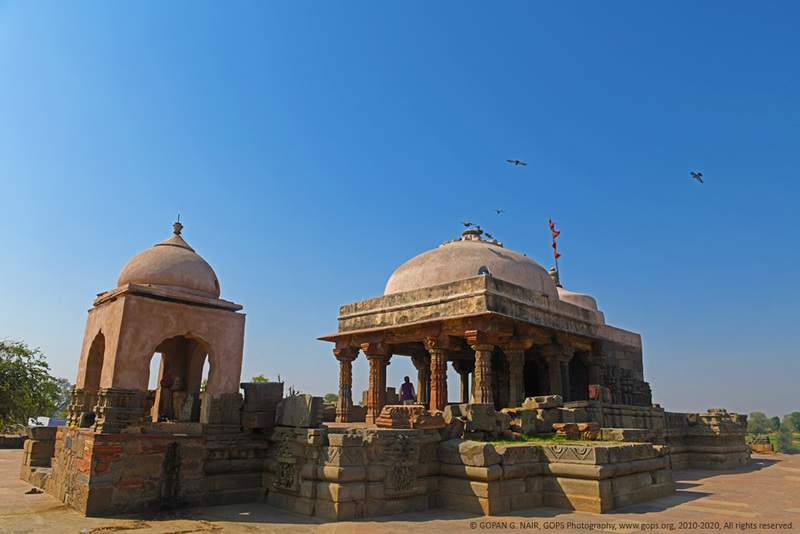 Abhaneri village lies 90 km east of Jaipur and 210 km south of Delhi on the Jaipur-Delhi highway. 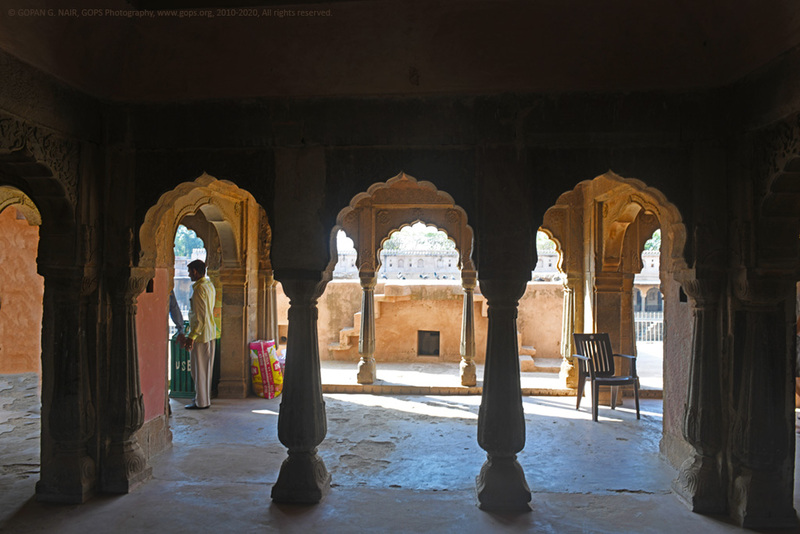 Highly skilled artisans still work for a living in these parts of Rajasthan. 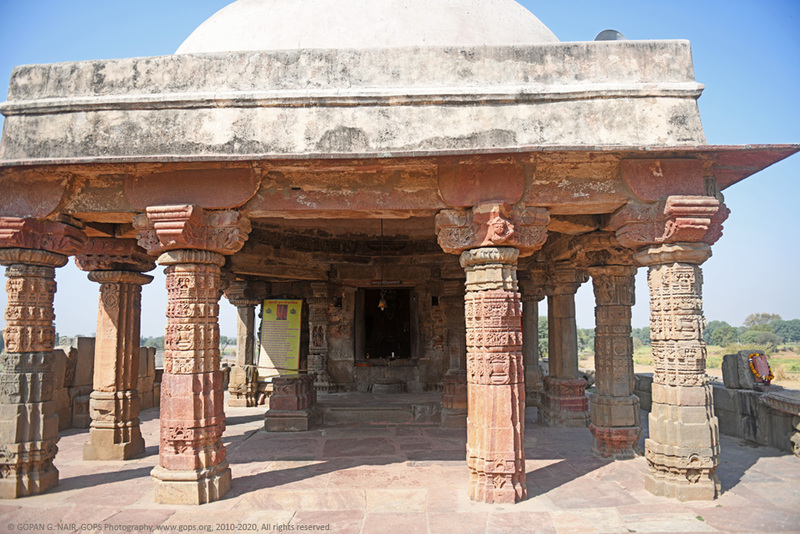 Adjoining the baori is another architectural masterpiece called the Harshat Mata temple dedicated to the goddess of happiness built between the 7th and 8th century AD. 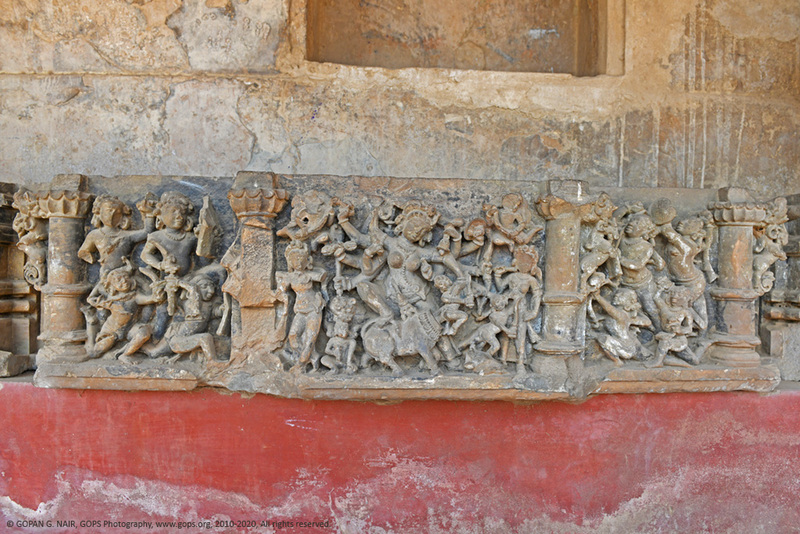 The temple was completely destroyed by Islamic invader Mahmud Ghazni and it was partly restored by Archeology department of India. 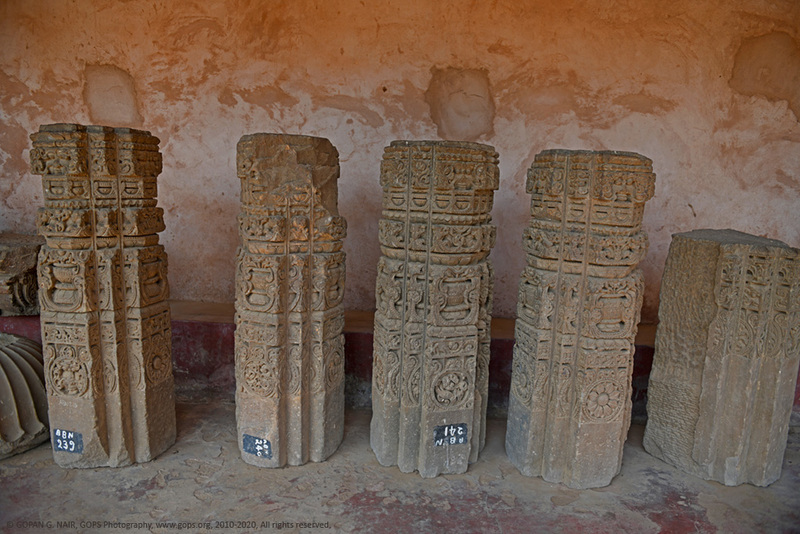 Heaps of intricately carved pillars, columns, idols now lie scattered around temple complex, which is a heartbreaking sight. 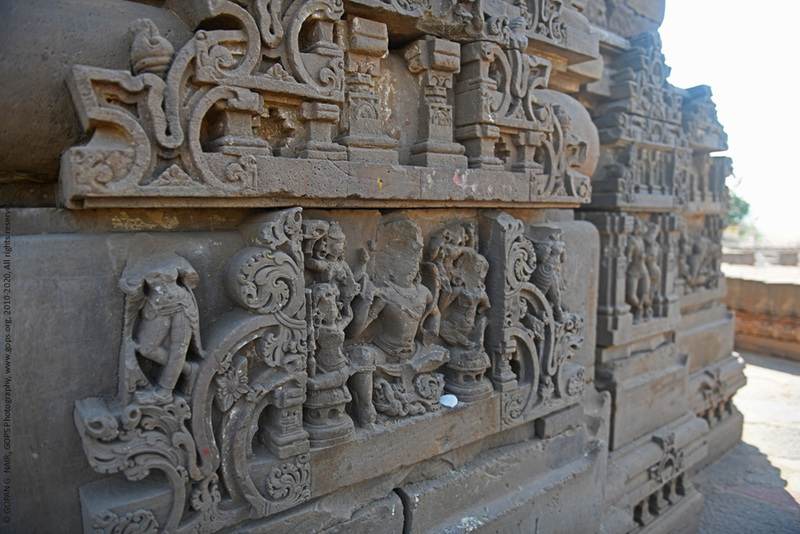 Remaining parts of the temple still shows the signs of vandalism with defaced statues and broken art work. 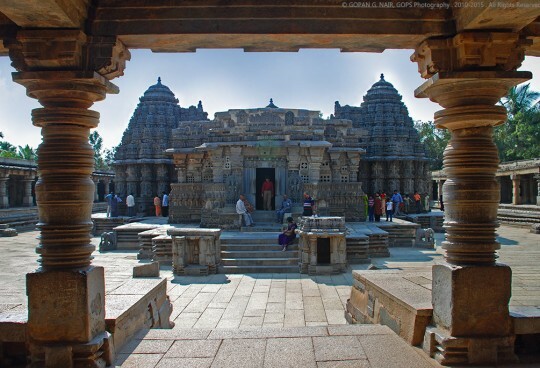 Looking at the quality of workmanship, one could imagine how magnificent the temple would have been once. The plight of the goddess of happiness was visible from the face of the priest who greeted me inside. 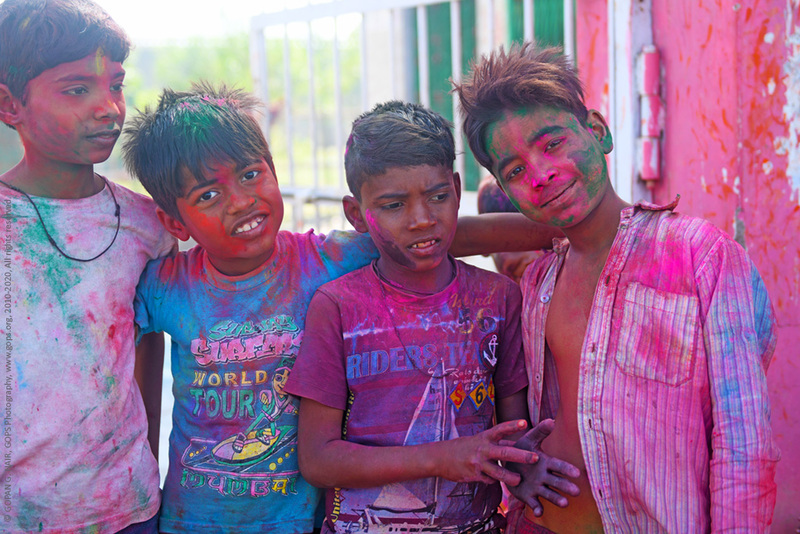 A bunch of little kids playing Holi seemed unaffected by the disturbing facts about Indian history and posed for my camera with their innocent smiles. A cool journey to the unknown place !! I am hearing this for the first time. 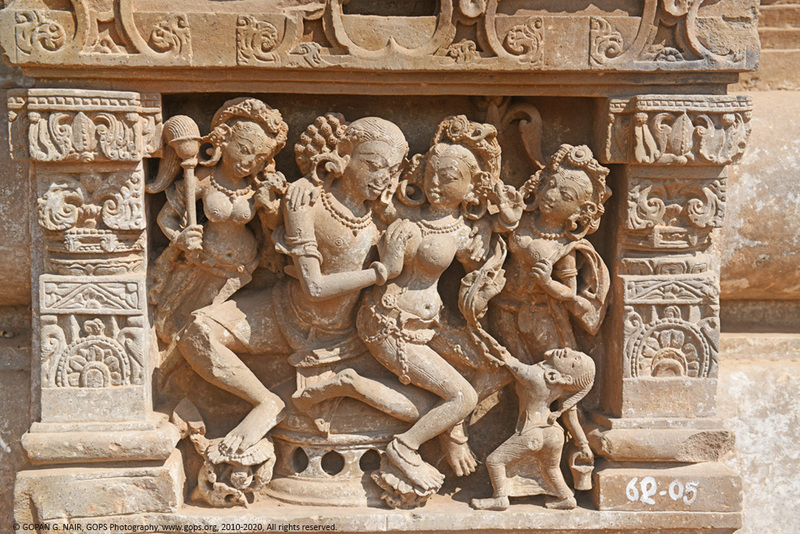 I was thinking “Rani ki vavi” in Patani in Gujarat is the only step well of great magnitude. This is something exciting. 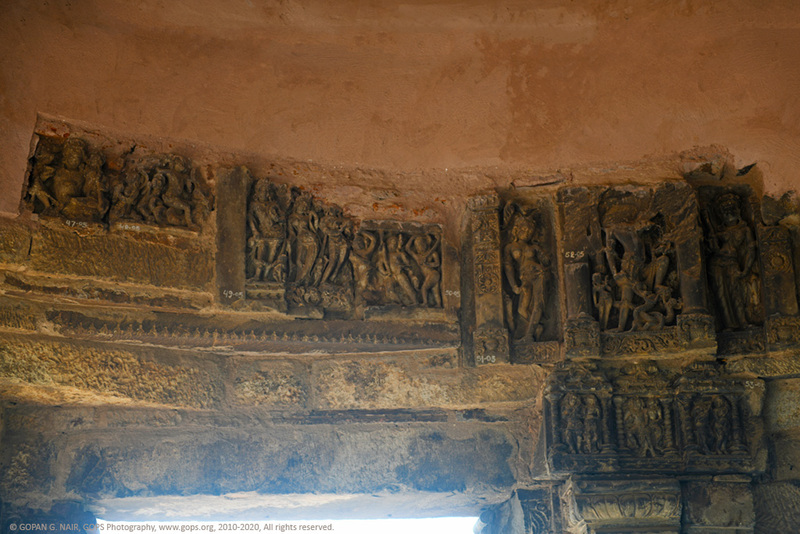 There is a step well or pond in Hampi also in a smaller scale. 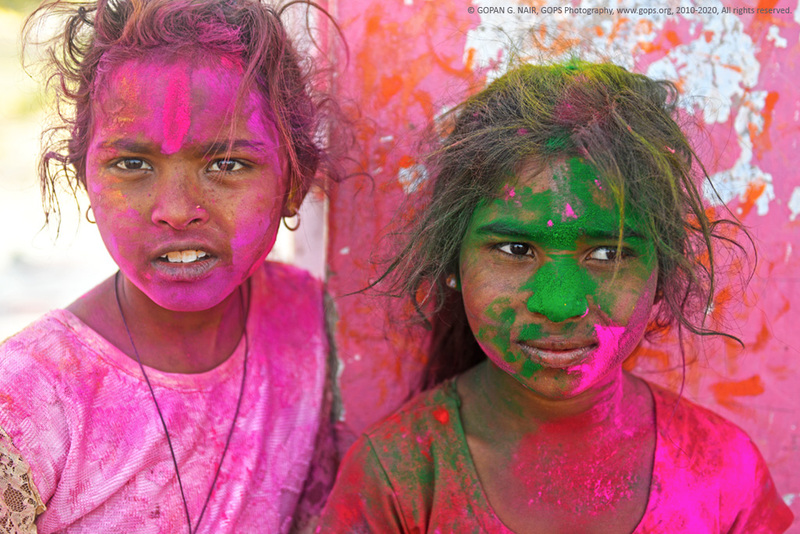 The article is complete with those kids celebrating Holi, Gopan !!! Thanks for the creation !!! Thank you very much for your usual support, dear Sir. Have a blessed day ! This is really a hidden treasure. Never knew about it during our visit to Rajasthan lately . Thanks for the wonderful narration & pictures. Thank you very much for your kind support. Let’s travel together and explore this wonderful country. What a marvelous story-telling !! Loved traveling with you to unknown places in India. Expecting much more. God bless you. Thank you very much for your valuable comments. Yes, India is indeed a mysterious land. Let’s travel together to capture its beauty.